As 1 LEGAL has reported correctly. 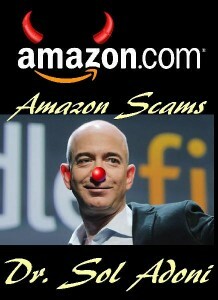 I am SUING AMAZON and Jeff Bezos over the recent banning of several of my books on Amazon. The reason is Amazon is a MONOPOLY so they are harming my Publishing Company by any such ban that was done with no valid legal grounds. Also, Amazon has greatly harmed my Publishing Company in competing with the Big 5 Publishers in regards to signing authors. Amazon has given BETTER DEALS to the Big 5 Publishers so they can charge more per book than my publishing company and not be harmed by the Amazon PRICE CONTROL POLICIES that hinder smaller publishing companies from competing with the Big 5 Publishers. Amazon is simply put a MONOPOLY in that it is such a major part of eBook distribution now that when they give a larger publishing company a better deal in regards to royalties it pays them, that creates an unfair playing field in publishing and inhibits competition. What do I want form Amazon? Easy, I want the same right as larger publishing companies to SET MY PRICES and earn the traditional 70% royalty Amazon pays publishers. Right now my publishing company I founded decades ago cannot compete with any of the Big 5 publishers due to AMAZON since Amazon has private deals with all the Big 5 Publishing companies where their books priced at $9.99 earn way more than they pay my publishing company if we price books over $9.99. Smaller publishers are handcuffed by Amazon to a $9.99 pricing ceiling on eBooks since if we sell a book on Amazon even for 1 cent over $9.99 we lost 50% of our royalties, that is PRICE FIXING and I will prove it in court. Now Amazon does have a right in my expert legal opinion to set ‘gude lines’ in regards to content they can legally refuse to carry or publish via the KDP program of Amazon. However, when they target a publisher or author and BAN THEIR BOOKS without good cause, that type of ban is so lethal today that Amazon better have a valid reason to ban any work since they are a MONOPOLY. My books have nothing in them to be banned by Amazon and yet several of my old and many new titles have been BANNED by Amazon. Amazon uses a 3rd world nation to police it’s content and the people now banning books such as mine are doing it without GOOD CAUSE and CAUSING FINANCIAL HARM to many authors and publishers being unfairly banned. Amazon cannot give me a valid legal reason for banning these books. My books on TIME TRAVEL that are sold now at I TIME TRAVEL. The fact is the actions of Jeff Bezos and Amazon are harming all small press publishers. How is Amazon harming us? Easy, they cut private deals with the Big 5 Monopolies in Publishing to allow them to monopolize Amazon in regards to selling major authors works at higher prices than we can offer an author due to Amazon PAYING THE NORMAL ROYALTY to Big Publishers on sales over $9.99. So why would a major author agree to sell their books for less than they can with a Big 5 Publisher on Amazon? They won’t and that is unfair and that is how Amazon has harmed my publishing company and every small publisher in the world. Amazon is a MONOPOLY and now I’m suing them.